Social activist Anna Hazare's hunger strike entered the second day on Thursday as he remained defiant on his demand for appointment of anti-corruption watchdogs at the Centre and in Maharashtra and resolution of farmers' issues. A bandh was also observed by locals in Hazare's native Ralegan Siddhi village in Maharashtra's Ahmednagar district in support of his demands. Hazare is sitting on a hunger strike in his village since Wednesday against "non-fulfilment" of assurances by the Centre and the Maharashtra government on the appointment of Lokpal and passage of the Lokayukta Act in the state. The 81-year-old Army man-turned-activist has also been demanding appointment of Lokayuktas in states where such statutory anti-corruption watchdogs do not exist. He has also been demanding implementation of the Swaminathan Commission recommendations on ways to address agrarian distress, besides some electoral reforms. Locals of Ralegan Siddhi village issued a statement on Thursday to local tehsildar, as an official representative of the state government, to look into Hazare's demands. Doctors conducted a check-up of Hazare and asked his caretakers to monitor the activist's condition closely. "He is over 80 years' old. He needs to be looked after," the doctors told Hazare's close aides. However, Mahajan said on Wednesday that talks were going on with Hazare and his supporters. "There will be some solution," Mahajan, a confidant of Chief Minister Devendra Fadnavis, told reporters in Nashik. "However, the strike will continue till the government fulfils promises they made before coming to power about passage of Lokayukta Act, appointment of Lokpal (at the Centre) and to tackle farmers' issues," he said. Hazare had written a letter to Fadnavis Monday, saying he would launch the agitation in his village from Wednesday. "It has been five years since the Lokpal Act was passed. Yet, the Narendra Modi government has not appointed Lokpal...Lokayukta Act has not been passed in Maharashtra for four years," Hazare observed in his letter dated January 28. The activist said Fadnavis had mediated when he had launched the agitation at Ramlila Maidan in Delhi in March last year. 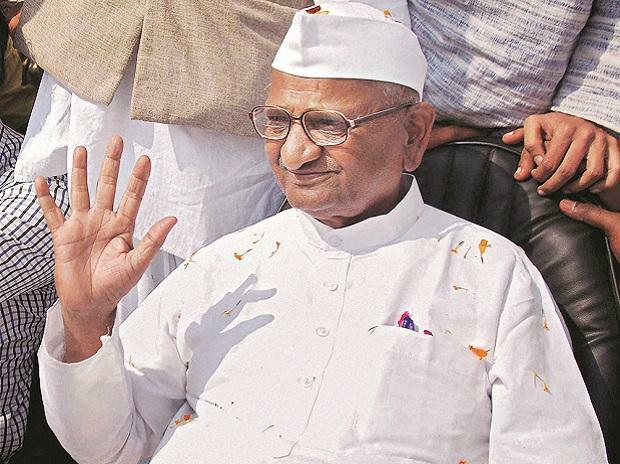 Hazare said he had withdrawn that agitation after the Centre assured in writing it would fulfil his demands. "Nine months have passed, yet the demands have not been fulfilled," he had said in the letter. The Fadnavis Cabinet had on Tuesday decided to bring the office of chief minister under the purview of Lokayukta. Hazare welcomed the government's decision to set in motion the process to appoint Lokayukta, but said that does not mean he will not stage hunger strike. "The agitation will go on until the Act is in place," he had said.